through a place called Living Hell. " LOL, there was a time when I fancied writing poems, was regarded as one of those kids that had too little to do, this was something I pulled out from my old poem book, I can't believe I still kept it tho. Jigoku shojo wallpaper has nothing to do with this poem of course, coincidence it was but yeah, it just so happen I found the bloody thing and made a wall up to compliment it. Oh, I think this should be a better wallpaper than my suzuhira wall. Gosh... I am such a romantic when it comes to making these, speaking of which I am using this wall now. Took me 4 days, and the color scheme was changed 2 times before it was like this. Textures are by you know who. and I do hope you enjoy this wallpaper. whao scary eh the poem + wallpaper ! Please send that poem to me in a messege I would very much love to have it. 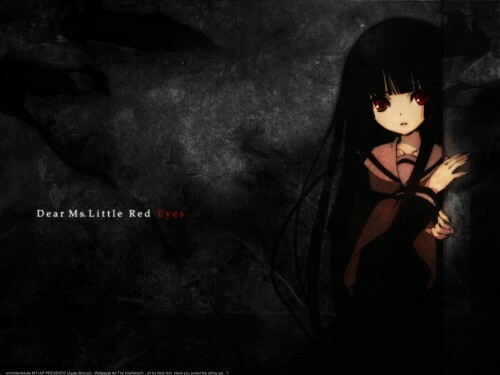 I love that image of Enma Ai. Very nice poem too. Eerie. Not to mention it comes with a grim poem. The texture and the shadows make her looks awesome. How about try inserting the poem faintly into the wallie or perhaps embedded on the wall behind? Hauntingly eerie. Love the wall, and the poem. The textures are fabulous and character placement is well done! Great job! This is so cool! The poem's awesome too! wow! nice! i like it! very nice! the poem is perfect for Ai! This wallie is very beautiful! Perfect job!